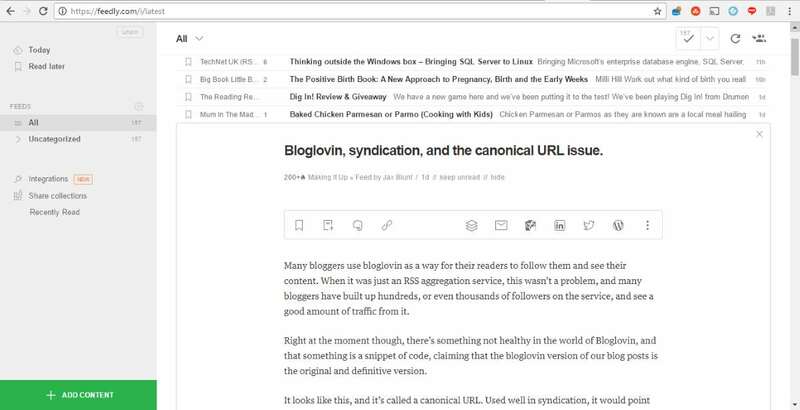 Bloglovin v Feedly – and what is RSS anyway? Time for an update on the Bloglovin situation. As you may have seen if you’re on social media (and if you’re not, how did you get here anyway? 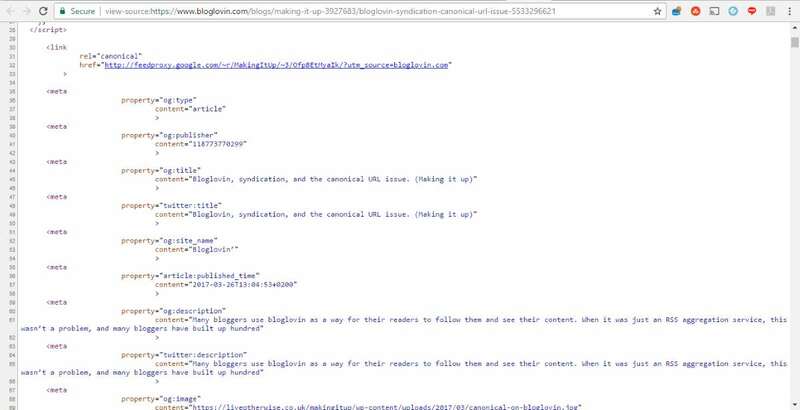 😉 ) Bloglovin have made a statement that the canonical URL pointing to their site was an oversight, it’s all been fixed, and everything is hunky dory. There’s still that little issue of a copy of your content on their site. And your images. And share options which share the bloglovin URL *not* your site. This isn’t how RSS readers usually work. Sorry, but no. Back in the mists of time (probably around 2005??) I did some development work using RSS, and for my sins, I know way more about RSS than most people realise there is to know. Basically, and this is the as non technical as I can make it version, your blog consists of content that you’ve written, then a whole load of instructions (html, css, code) that are used by computers at various stages to display it in friendly formats for people to read. Your content in this case isn’t just the blog post itself, it’s the tags, categories, title and so on – all the bits that are different from post to post. RSS is a different way of describing that content, and it’s utterly consistent so that every RSS reader everywhere knows exactly what data it’s getting. Yes, readers can then display it differently, and can make it more or less pretty, but RSS is a really tightly defined way of listing out which bit of content is which. What does Bloglovin’ do with my content? Once we discover new content via your RSS feed we incorporate it into our platform in a few different ways. First, we update your blog’s profile page on our platform, this page contains a summary of ever post on your blog. Next, we create a page on our site where your content lives, this page has a canonical URL pointing to your blog post and ensures that google and others know that you are the creator. You get all the credit for the post. We prominently display your blog’s name and URL, and link directly to the original post. OK, and this is where we’ve gone a bit off the reader aspect of it all. Disregarding the canonical bit (which isn’t entirely correct if you’re using feedburner or feedblitz to serve your feed, they’re using that URL not your site URL), let’s look at what happens with that content page. If you tweet this version of someone’s post, you tweet a link to bloglovin. If you pin an image, you pin the bloglovin page. How is this giving the content creator all credit for the post? Good grief, my name as author isn’t even on the page! If someone comments on this created page, I don’t get a notification, and as far as I can tell, I can’t moderate it. Jolly good. Can’t see any potential issues there at all. What should a good RSS reader do? Enter Feedly. Yes, it’s still minus my blog sidebars and so on (which means any advertising there is invisible) – that’s because RSS only serves up your written content as it were. But see those share options? If you use them, you share links to your post, direct on your site. Feedly isn’t hogging the limelight here, they are merely allowing people to gather feeds in one place, read the content quickly and easily, and interact with it in the way they want. Perfect. If you want to set your RSS to an excerpt (wordpress>settings>reading) feedly will display just that excerpt with a link to let people arrive at the original. Do be aware that will affect anything that relies on your RSS – so potentially email subscriptions? Depends how you’re setting it all up. It might be that you’re OK with that. It might be that you feel that being visible on bloglovin has value for you – and only you can take that decision. But I’d ask you – how many views are your articles getting on their site? And how much traffic is actually arriving at your own site from there? Who is really getting the benefit of your hard work here? Is it you? Or is it bloglovin? I’ve switched to Feedly for my RSS too now, and am in the process of removing myself from Bloglovin’, daren’t delete my account until I know my blog is off it though! Thank you so much for keeping us informed on this issue! Interesting article. When Google reader went, I tried both and stuck to Feedly. I’ve only recently popped back to Bloglovin’. I notice quite a few people follow me on Bloglovin and then jump to my site to read. I’ll have to look back to see if there is a pattern. Really useful and thanks for explaining the technical side of it in lay-blogger terms and what changes that’s brought in. I need to move to Feedly. Thanks again, Jax! I was directed here by mumofthreeworld i deactivated my account today from bloglovin, i’d heard the above a month or so back but hadn’t acted on it until someone said they’d been leaving comments and i never replied, how dare they?